Can I ever say it enough that we all need to talk to our older family members? I’m always telling others this, but it wasn’t until I wrote out a simple Tweet yesterday that it hit like a bullet just how important it is to interview our older family members. I started out casually browsing through my Twitter feed and came across a tweet that took me to an article posted on Crestleaf.com’s Blog titled, “Breaking Genealogical Stereotypes: Interview with D. Joshua Taylor.” You can find the entire interview here. I have listened to quite a few talks by Mr. Taylor and of course have been watching him on Genealogy Roadshow so it caught my attention. 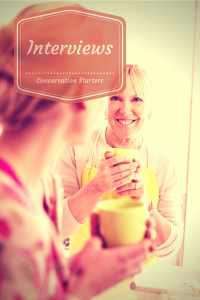 In the article, Crestleaf asks what is important when interviewing relatives. Ask them to give you a memory about yourself. Now, staying away from judging my tweet for its brilliance or lack of, this short couple of statements stopped me for a moment after I hit “send.” You see, I had make the attempt to talk to all my elders and my husband’s older family members several years ago – within the past fourteen years. Why specifically “fourteen?” That’s easy. My mother passed away from non-hodgkins lymphoma in 2000. Suddenly, she was gone. Way before that we had even had discussions on what she might do if she outlived my father. And now my mom was the one that was gone. Always planning on having her around until she was past her eighties, she was gone at age 70. With her went all the stories of her past that I vaguely knew about but never had asked specifics. I’m terribly sorry to be such a downer in this writing, but sometimes it takes a shocker like loosing a parent to jolt you into action. Lots of good came from this loss of my mother because in a way, I might not have thought too much about trying to interview all my relatives. What’s funny is that I probably wouldn’t be in the position that I am today with my family history research if she had lived a long life. I wouldn’t have felt the need to get those interviews. What would I have missed? My great-aunt on my father’s side described both of her grandfathers and gave me quite a few details about her own father, my great-grandfather. I would have never had these details by simply searching through records and books. They wouldn’t have told me that all four generations of Julian men, including my father, were very focused on work. They worked long hours to the point that family time was cut short, but they all felt a great need to push themselves to finish what was at hand. They needed to get the job done. Of course I knew this about my father, but after talking with her, it all suddenly made sense. And it made even more sense when I looked at myself and my brother with this knowledge. What I had held as a slight grudge against my father for always working, became something that was bigger than him – it was “in his DNA” as you might say. Lots of other priceless stories came from these interviews, too many to tell all at once. But the striking thing about this is that they are all GONE. Every last one of them has passed away. Can we take the chance to not get the family stories written down somewhere for the future? Finding out about your family’s history and their stories, gives you a foundation to live on. The oldest relative I knew was my great aunt Ruthie, the same generation as my grandparents. I only wish I had talked with her about her family when she was still around. She lived to be 99 years old. Thanks Jim! Sorry I didn’t see your comment sooner; it went into a spam filter for some reason. It’s always funny how we think our family members will just be around forever. I learned such a valuable lesson when my own mother passed away way too early. So many stories that I didn’t get written down and now it is only vague memories, which is really upsetting. But, I am hoping that I can pass on the sense of urgency to as many people as possible — young and old! Thanks for the welcome to Geneabloggers! I definitely will be checking into your blog/website further. I have my own website but I am also the genealogist for The Society of Indiana Pioneers and I try to pass on good resources to our members. The Great Thanksgiving Day Listen — Let’s Do This! Michele Kerr on TurboScan step-by-step. Making your research so much easier! stephanie on TurboScan step-by-step. Making your research so much easier!